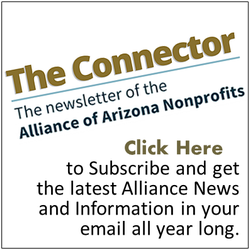 Through a collaboration with the Society for Nonprofit Organizations (SNPO), Nonprofit Members of the Alliance receive SNPO membership benefits, including a subscription to Nonprofit World magazine. This benefit is a $69 value and is included as part of your annual membership dues. Nonprofit World is published 6 times a year, and offers nonprofits what few other magazines can. Sound advice, case studies, and easy-to-read format — all work together to create a publication of lasting value for board members, paid staff, and volunteers. The subject matter covered is extensive: accounting, board development, communication, computers, fundraising, law, management, marketing, personnel, and volunteers. The authors are some of the field’s best: Brinckerhoff, Ellis, Hopkins, Martinelli, Tesdahl, Warwick, and Weisman, among others. Quite simply, Nonprofit World is “must reading” for anyone interested in the ever-expanding world of nonprofit management and leadership. Click here to learn more about the SNPO member benefits Alliance Nonprofit members receive.